A few days after Eric Pickles failed to get CCTV enforcement vehicles banned outside schools Cambridgeshire County Council launched a road safety video featuring hundreds of primary school children that encourages parents not to flout parking laws outside schools. A road safety spokesman for the council said that parking issues outside schools were one of the most common issues they dealt with and police officers urged antisocial parents to “shape up and stop wasting police time”. Earlier in the year the police had a crackdown on the “nightmare” illegal parking outside Cambridge schools following reported fights between parents with some success! And here is a photo I took a few days ago outside a local primary school shortly before children started arriving. 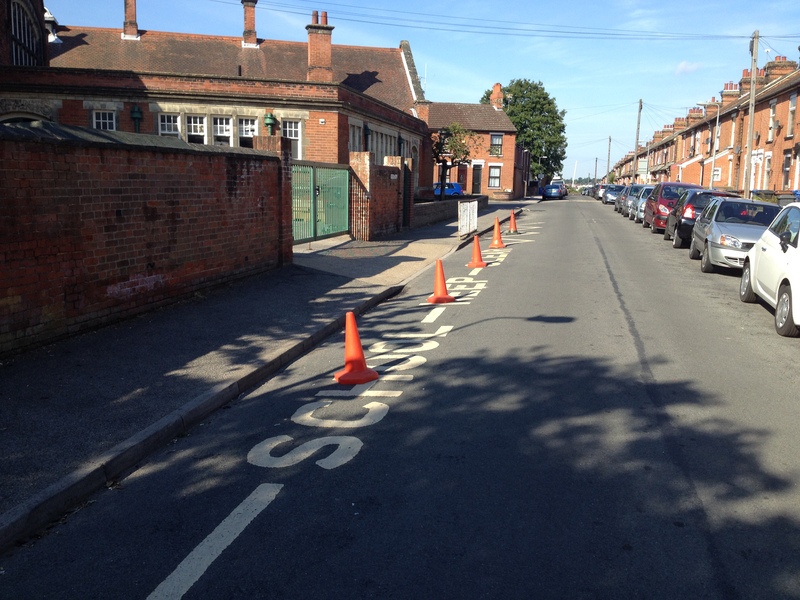 The caretaker puts cones out on the zig-zags every day because they are ignored otherwise by some parents, and even when they do put them out I have seen parents squeezing into the spaces at the end of them! When will our politicians ‘brave up’ and realise that they should be supporting our schools, kids, councils and the police instead of listening to a minority of drivers who cause so many difficulties for the rest of us?